A new version of permute has been released and some of the functionality described in this post is out of date. Multivariate ordination methods are commonly used in ecology to investigate patterns in species composition in space or time. Constrained ordination methods such as redundancy analysis (RDA) and canonical correspondence analysis (CCA) are effectively just multiple regressions, but we lack the parametric theory to adequately test the statistical significance of terms in the model. Other techniques likewise lack the appropriate theory, such as the Mantel test, vector fitting into ordination space, among many others. Instead, permutation tests are used to form an appropriate Null distribution for a test statistic against which we can evaluate the observed value of that statistic. In constrained ordination the test statistic is usually in the form of a pseudo F statistic, although one advantage of the permutation approach is that any suitable statistic can be used in the test. If the observed value of the test statistic is unusual in the context of the Null distribution derived by permuting the data, say in the top 5 or 1 percent, we conclude that the observed relationship is unlikely to have arisen by chance and is therefore significant. Simply shuffling the rows of the input data, a process also known as a randomisation test, is sufficient where the observations in the data are independent. 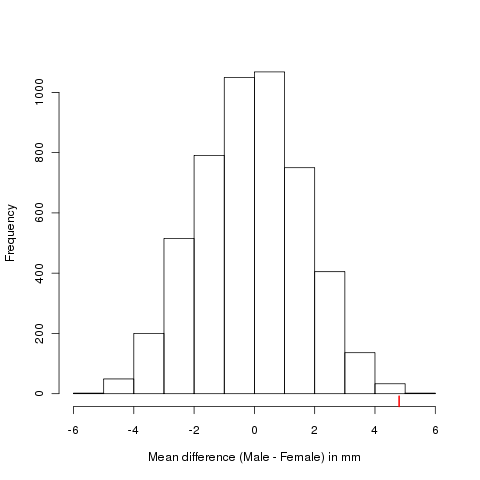 If the observations are independent, under the Null model any row from the species data can be matched with any row from the predictor data, which justifies the use of randomisation as the basis for testing the significance of the model. In many cases, however, ecological data are not independent, having been collected sequentially in space (a transect) or time (time series). Designed experiments are commonplace, with replicates located within plots that are experimentally manipulated. Observations might also have been repeatedly made from within a number of sampling locations or plots, or from a spatial grid over the region of interest. The vegan package has long had permutation tests, based on the function permuted.index(). This function allowed for simple randomisation, or randomisation within groups, defined by a factor supplied as argument strata. CANOCO has long had support for these restricted permutations methods. I have been working sporadically for several years developing code initially in vegan and then under the banner of the permute package to implement similar functionality. In a series of posts over the coming weeks I will explain what permute can do and illustrate how to use the package. Over time, myself and the other vegan developers will start interfacing existing functions in the package that use permutations with the permute package so that gradually the scope of permutation tests in vegan will improve. To get you started though, here is a quick, simple example of doing a randomisation test using permute. This is comparable with the p value determined via the t-test and indicates strong evidence against the null hypothesis of no difference in mean mandible lengths. This we can reject the Null hypothesis that male and female golden jackals have similarly sized mandibles. I hope that has whet your appetite? In future posts I'll explain more about how permute works and explain how to use it to generate restricted permutations. Higham C, Kijngam A, Manly B (1980). An analysis of prehistoric canid remains from Thailand. Journal of Archaeological Science, 7, 149–165. Manly B (2007). Randomization, bootstrap and Monte Carlo methods in biology. 3rd edition. Chapman & Hall/CRC, Boca Raton.